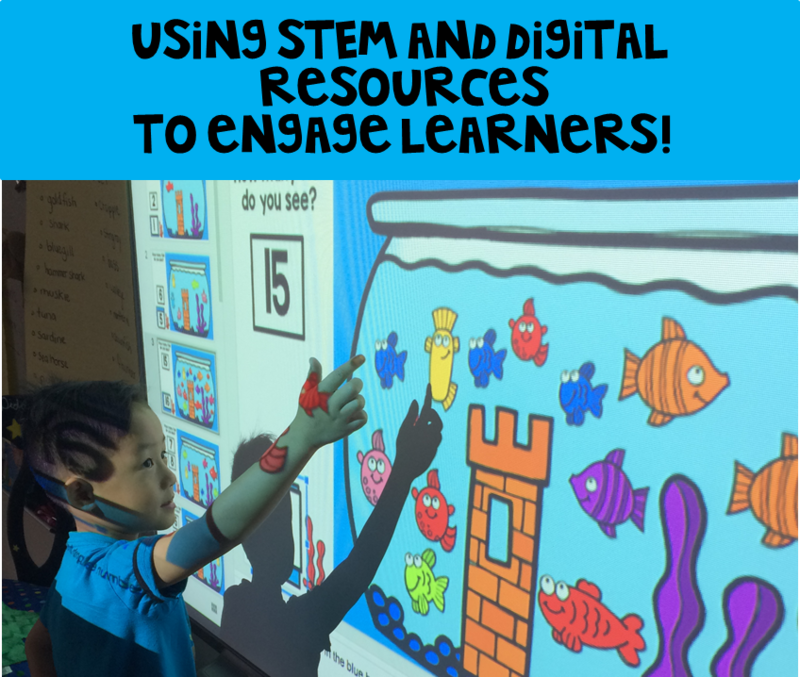 Science Weekly Digital and STEM Fun! My week begins on a Tuesday...yes not Monday...Tuesday. Why? Well we are on a day one through five schedule not day of the week schedule. So it is Tuesday and I wanted to share with you what my week looks like! Getting ready for the kiddos this weekend! 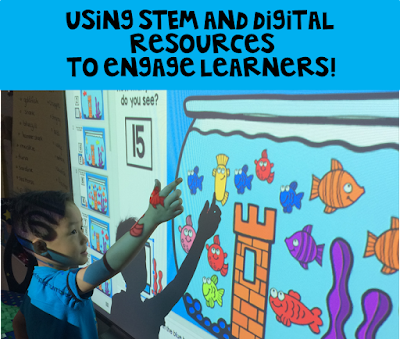 I love using digital resources to help my littles show me what they know! We are starting our first week of wrap ups on our five senses. To use all five senses we are using popcorn to do that! I will be starting with them at the carpet as I review our senses we already used. (I have the popper started!) All of a sudden we hear something! Then...smell something. By that time they figure out what we are making and we then go to the table that is a safe distance away from touching something hot. While we wait for the popcorn to cool down we meet at the carpet area to use our popcorn slides as a review. They love being able to come to the board and move the pictures to show what sense we use when we see a magic word such as hot or salty. When they are done, I send them back to their desks to get a cup of popcorn after I salt and butter it. We start with one sense at a time...with tasting being the last sense! As they use each sense I write down on our anchor chart the property words to describe each one. 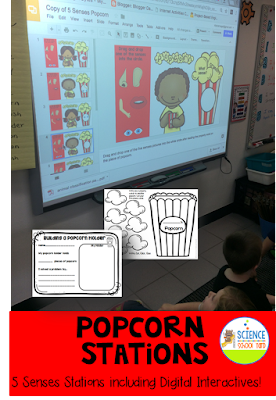 I give them a popcorn shape to draw one or more ways they use their senses when it comes to popcorn! I play popcorn music as they work! We finish up with a short story by Frank Asch called of course...Popcorn! We then create the beginning of our anchor chart. What animals did we hear about in our song? We then move onto our non-fiction book, What is An Amphibian? from Epic Books...free for teachers! We then play a game...Is it an amphibian? If it is...they hop like a frog! 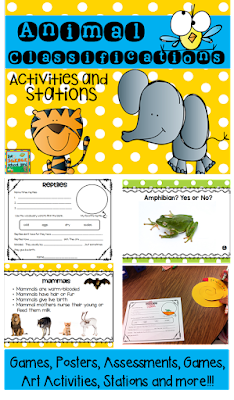 We follow it up with a writing and assessment sheet found in my Animal Classifications Pack that is continually getting updated as I add more ideas and activities! Animal Classification Pack: Mammals, Amphibians, Reptiles, Fish, and Birds! When we get done we color a salamander pattern that I found on line! We are using our FOSS Air and Weather Kit. I need to follow a road map that indicates which lesson I should be on at a given times so that our eight other Science Educators and I can cover the same "Big Ideas". At times, I can find ways to add some STEM activities that tie in what we are learning about such as last week's parachute lesson and a Jack and the Beanstalk connection...however this week is air pressure. Not quite as exciting for an hour long class. So, sometimes I just can't make my own extras I call upon the help of Ms. Frizzle! I found a perfect video...Goes On Air... and sheet from Scholastic along with our FOSS syringe lesson. This is okay for me because they can't watch videos in their rooms due to the strict road map they are on for virtually everything. I am glad that I have that flexibility! Here is the link for the video: Magic School Bus Goes On Air. Here is the Scholastic Classroom Activity Site: Scholastic Magic School Bus Activity Page. Once again FOSS gets me...we are using our mock rocks to learn about crystals. I brought in a crystal for them to see...we read a crystal book from Epic Books called What Are Crystals...ok I just skimmed and paraphrased for them. That is the beauty of using the smart board to project stories. (As a science teacher with no transition time, I can even put on the read the book to me button at times, allowing me to set up supplies on tables). Once we are done with an intro to crystals, we review what a geologist is and what they do. Geologists use different experiments and techniques to break apart rocks or look more closely at what they are made of. We share how our mock rocks are used to compare what geologists do to real rocks and then we look at our vials to see what ingredients I might have put in our "recipe". I stress the idea of a recipe so they know that rocks are more than one ingredient and minerals are only one ingredient...just like a recipe. We discuss evaporation, which I taught last year. We then do the FOSS lesson, but we use our iPads to take pictures and not draw the vial. Once done with the writing, this helps me get them finished...I then let them come to the crystal table which has hand lenses set out as well as the identification chart. We need evidence as to why I put in the ingredient I did! How do you know...is the big question of the day! We celebrate our learning by eating a bit of rock candy and writing in our crystal ball! Here is the sheet that we used! 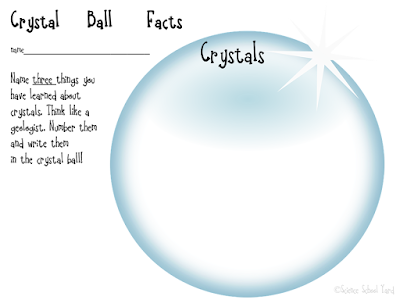 Enjoy the quick and easy freebie I use with crystals to check for understanding. I take a picture of this with my iPad, then air drop it to them. They put it into Explain Everything! We just finished up on our FOSS lessons with magnets. 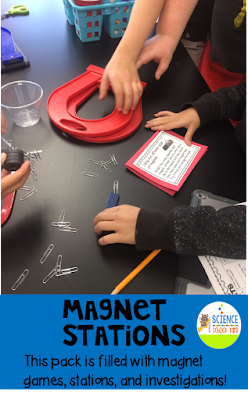 This week, we are reviewing with magnet stations! I set up eight stations that I made in my Magnet Pack using all of the supplies from my FOSS magnet kit, however I also use other supplies that I have for this unit to add some added magnets and magnet toys. Once they are done reviewing they assess their effort and then we review the answers. This helps them focus on getting a certain amount done in the time they have to finish the stations and it also helps my lower level learners understand and review what they might not know yet. Take a look at the stations in action! I love these Magnet Stations Found HERE! They keep our FOSS magnet lesson more engaging and allow for more assessments! We are learning about life boats so what a perfect time for this History minor to teach a history lesson! I give each fifth grader a steerage ticket that I made as they walk in the room...of course to the Titanic Theme Song as an instrumental. I let them pick from my hand to get their fate. First class has nice cushioned chairs and a glass of water. I get them their supplies all ready as well and they sit up front. My second class ticket holders sit at tables away from the front and get pencils, and the third class passengers sit on the floor in the back and share a few pencils between them. They love it! I use the Book National Geographic Titanic to read to them on the smart board, which once again is from Epic Books! Once done, we discuss what a life boat is and what capacity means. We share what we know about boat size and capacity! I get them all together and we watch a quick video on what happened on the Titanic and the capacity of the life boats that were launched. It is a perfect connector! I then share that we are making our own life boats using a controlled experiment model. I give them each a piece of aluminum foil the same size, the variable how they build and form the boat. We then test how many "penny passengers" fit in the life boat. What a great STEM lesson to tie it all together! 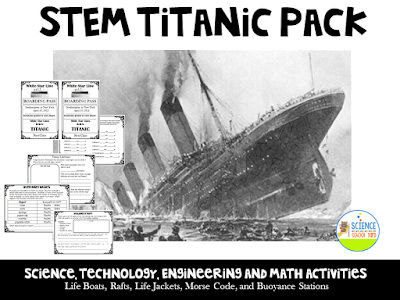 Next week, our FOSS life boat lesson and another STEM project found in my Titanic Pack! So that is my week in review. I didn't mention yet that I am also teaching an after school STEM class...that will be another post this next week!